Catch gold fever and experience what it was like to seek your fortune during Gold Rush days! Learn to pan for gold (and keep all you find! ), then discover Juneau's colorful mining heritage for yourself. Head out with a prospector/guide in authentic 19th-century dress for a historical tour of Juneau including the state capitol. It's guaranteed you will walk away with some gold. Then, turn up the road to Gold Creek and Last Chance Basin, where Joe Juneau and Richard Harris struck gold in 1880. 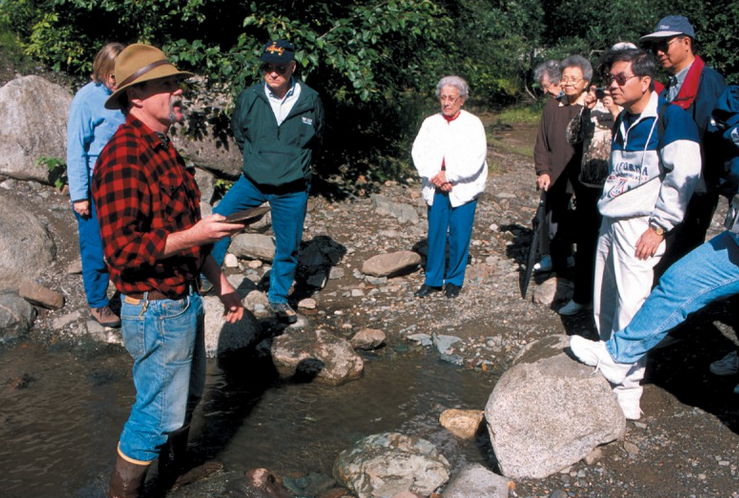 In a beautiful, secluded setting near a waterfall alongside Gold Creek - only accessible under our tour special permit - your prospector shows you how gold panning is done. Then, it's your turn, as you learn how to expertly work the pan with helpful tips and advice. You can choose to pan in the creek, or in the waist-high demonstration trough. Every one of all ages and those with limited mobility can learn how to pan and capture the full gold-rush experience. Remember, all that glitters is yours to keep. You are surrounded by remnants of the original buildings of the Alaska-Juneau Mining Company, which at the height of production was the largest operation of its type in the world. You'll learn about the mining techniques that were used; and more about the quest for gold that is so much a part of Alaska's history. Take home a souvenir Orelove Brothers Gold Claim Certificate, all the gold you find, and an appreciation of what is was like to seek your fortune in the wilds of Alaska more than a century ago. Now it's time to eat! The Gold Creek Salmon Bake is an event that's been grilled to perfection for more than 30 years. Savor an all you can eat adventure, in a unique outdoor setting you'll find nowhere else. Arrive at a beautiful setting in a lush rain forest alongside a creek, under translucent domes that protect you from the elements, rain or shine. Savor the aroma of wild salmon, grilling slowly over fires of fragrant alder wood, and settle in for a feast for all your senses! The sumptuous spread has something for everyone. Choose from grilled salmon, Cheechako Chicken, Chilkoot Baked Beans, Tongass Wild-Rice Pilaf, Gold Rush Potatoes and a robust selection of other sides, salads and beverages. Beer and wine are available for purchase, and vegetarians take note - there's plenty to tempt your palate! Come back for seconds, or thirds, while a local musician sets a festive mood. And just when you think you have had enough, they bring on the blueberry cake for dessert! After dinner, roast marshmallows over a campfire and stroll through the forest to lovely Salmon Creek waterfall. Join a prospector for a tour of the remains of the Wagner Mine, learn about the natural history of the area, and try your hand at panning for gold. Visit the trading post to purchase a souvenir gold pan or other memento. There's plenty to do, and shuttle buses run regularly, so your visit can last as long as you like. Don't return until your tastes have been satisfied - and you're filled with great memories! Beer and wine are available for purchase. Suitable for all ages and no prior experience necessary, just good health and an adventurous spirit. Children 12 and under must be accompanied by an adult. Children ages 13-17 must have a signed parental consent form to participate in the absence of a parent or guardian. This tour is not suitable for wheelchair and/or scooter guests due to the uneven terrain at Last Chance Basin and the salmon bake. IMPORTANT INFORMATION: Please be advised that you will need to confirm when the shuttle buses leave in order to ensure that you return to the ship before departure. Some final notes: bring your vouchers and dress comfortably for the weather (if your tour is on the water it will be about 10 degrees cooler.) Camera and binoculars are suggested for land-based tours. However, while on tours involving rafts, canoes and kayaks, we suggest you bring disposable cameras.